Huntsman Cancer Institute is located at the northeast corner of the University of Utah campus in Salt Lake City, just east of Primary Children’s Hospital and University of Utah Hospital. View and print our map and directions sheet, which includes information about our free valet parking (available Monday-Friday from 7 a.m. to 5:30 p.m.). Take I-80 east for about four miles to the 600 South exit. Follow 600 South about two miles to 700 East. Turn left. Go five blocks north to 100 South. Turn right. Head east on 100 South for one mile. The road becomes North Campus Drive. See The final stretch below. Take the 600 South exit. Go east about two miles to 700 East. Turn left. Go five blocks north to 100 South. Turn right. Head east on 100 South for one mile. The road becomes North Campus Drive. See The final stretch below. Take the 400 South exit. At the first stoplight, turn left onto 400 South. Head east about two miles to 700 East. Turn left. Go three blocks north to 100 South. Turn right. Head east on 100 South for one mile. The road becomes North Campus Drive. See The final stretch below. Take the Foothill Drive exit. Go on Foothill Drive about two miles. Turn right at the U of U sign onto Mario Capecchi Drive. The road curves past Moran Eye Center and Primary Children’s Hospital to North Campus Drive. Turn right. See The final stretch below. Follow the road east past Primary Children’s Hospital and the U of U Hospital. The street becomes North Medical Drive. Continue ahead to Huntsman Cancer Institute and Hospital. The street becomes Circle of Hope Drive. Follow signs to free valet parking at the front of the cancer hospital. Or, self-park for free in the parking terrace. Access elevators on P4 of the parking terrace, which is Level A of the cancer hospital. Parking is free for patients, Cancer Learning Center patrons, and visitors. The hospital lobby and elevators are accessible through glass doors on Level 4 of the parking terrace. 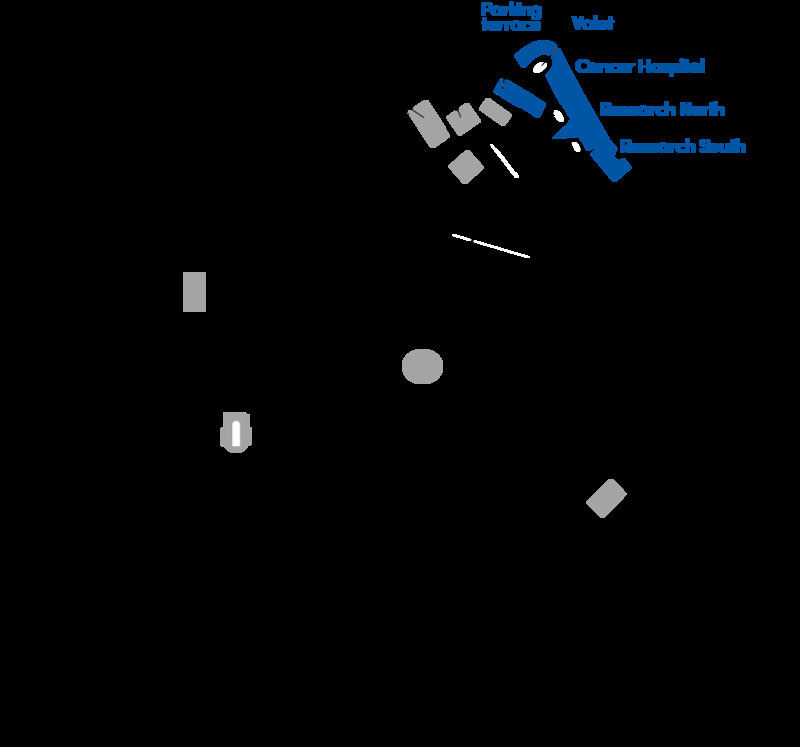 Download a map to free valet parking at the front door of the cancer hospital. Self-parking is also available in the parking terrace. Learn about public transportation options. Jon and Karen Huntsman envisioned art as an important part of the inspirational environment they wanted for Huntsman Cancer Institute. The G. Mitchell Morris Cancer Learning Center is your source for free cancer information. Get answers in person, over the phone, and by email, text, and live chat. The Elyse Pantke White Chapel and Meditation Room on the 5th floor of the Cancer Hospital is a comfortable space for quiet reflection. Religious services are held throughout the week. Guests of HCI inpatients can access a kitchen, laundry facility, showers, and a business center on the 4th and 5th Floors of the HCI hospital. Find unique cards, home décor, toiletries, snacks, custom-made flower bouquets, and gift baskets. Open 8:30 am–5 pm weekdays. Located on the 1st floor of the HCI hospital. Enjoy fresh air, comfortable chairs, and a labyrinth for meditative walking. Access from the 4th floor of the HCI hospital. Get your prescriptions filled during your appointment, with same-day refills on most prescriptions. The Linda B. and Robert B. Wiggins Wellness & Integrative Health Center promotes physical and emotional well-being for people affected by cancer. Patients, loved ones, and staff can find fitness and nutrition classes, massage therapy, and more. The Point Restaurant and The Sheila S. and David P. Gardner Bistro are open to the public and provide a breathtaking view of the Salt Lake Valley. Both serve delectable fare including soups, salads, sandwiches, a variety of hot entrées, and daily specials. Featuring guest restaurants Tuesday through Friday. Faculty and staff can find menus and specials on Pulse. For more information about The Bistro, please call 801-587-4600.